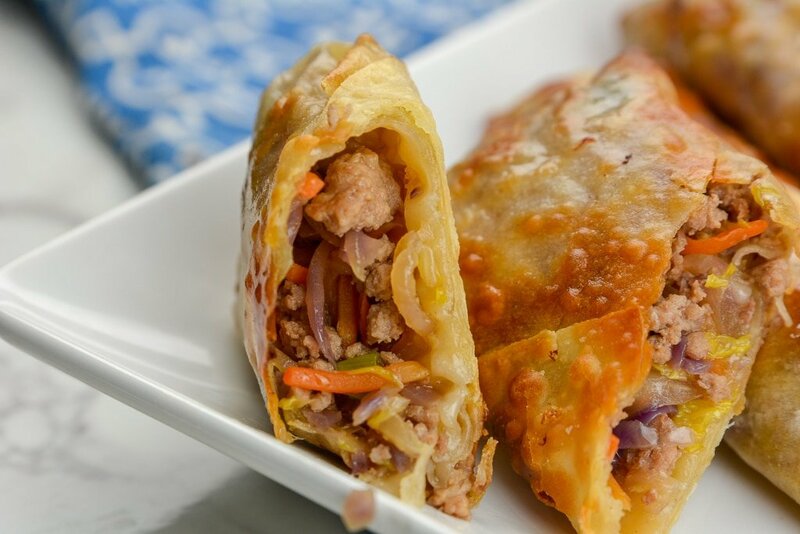 Whip up this Easy Egg roll in a Bowl for a quick and easy dinner this week. You get those components of an egg roll but without all the headache of rolling and frying each roll. 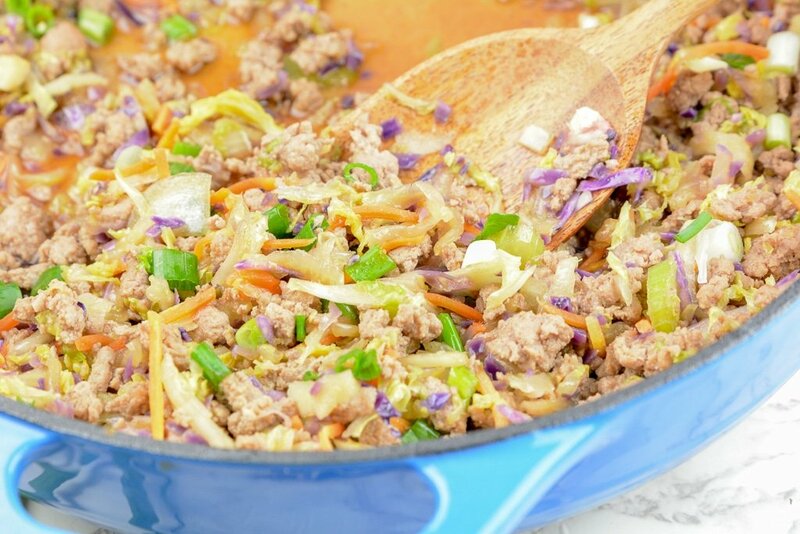 This is an egg roll in a bowl that will become an instant family favorite. 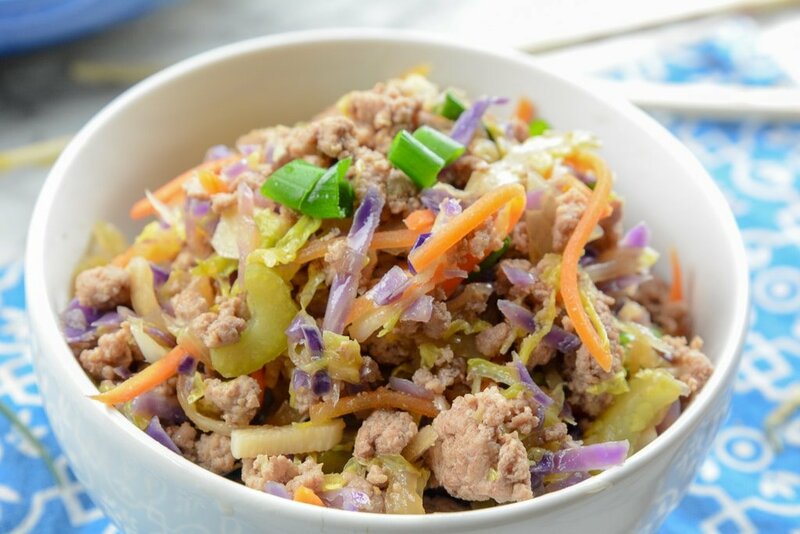 Tender cabbage and carrots, ground pork, and spices for flavor. Chinese is always a favorite in our home. But, with a lot of Chinese food, you will find it is high in carbs because it is more of indulgent food. Well, this egg roll in a bowl is a healthier alternative to a classic egg roll. You could even cook up some won-ton chips to dip into your mix, for that added crunch you might want. One pot does it all for a no fuss and no mess dinner. I make it even easier by grabbing pre-made coleslaw that I dump and stir into the cooked pork. We have made this recipe for a few years, I hopped on the bandwagon when I saw this plastered all over the internet years ago! It is now a family favorite that I make often. I have tried making this same recipe in the Instant Pot and I have to say I prefer the skillet option better. It is so simple to make in a skillet you won’t miss your Instant Pot. 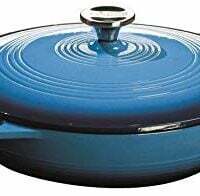 You all know I love my Instant Pot, but sometimes other kitchen accessories just work a bit better! Looking for More one-pot meals that are easy and not done in the Instant Pot? Okay, you also might know this as crack slaw. I learned this a while back when a friend said crack slaw, and I had no idea. This meaning this recipe is just as addictive as it can get. And they were right, it truly is! We don’t mind eating this all by itself. But sometimes we want to dress it up and I will make some wonton chips. It offers a nice crunch factor. Yes! If you don’t want to use coleslaw mix, just slice up your cabbage as you would, and toss it in. You might want to add in some slivered carrots as well. I just prefer a bag, for the ease! This dish is such a tasty recipe to add to your menu rotation. Cabbage is loaded with vitamins, minerals, folic acid and more. So if you want a lower carb dish that is packed full of flavor and nutrients, give it a go! 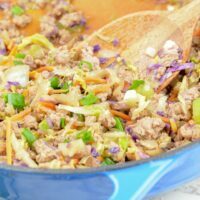 Can you Use Easy Egg Roll In a Bowl To make Egg Rolls? Have you ever tried an Egg Roll In A Bowl? 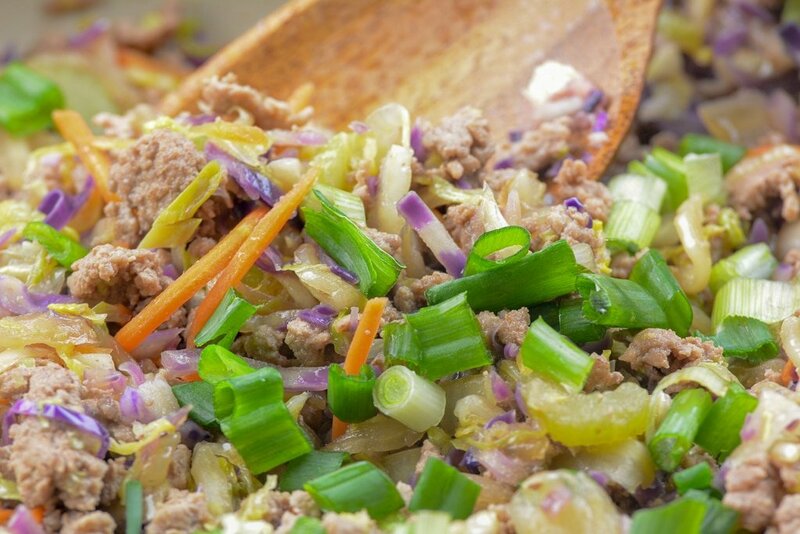 Whip up this easy pork egg roll in a bowl for a quick and easy dinner this week. You get those components of an egg roll but without all the headache of rolling and frying each roll. Place your pan on medium heat. Mix in Cole slaw bag. Cook on low for 5 minutes until cabbage is soft. Top with thinly sliced green onions.